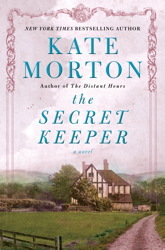 Kate Morton is the author for Downton Abbey lovers. Her historical fiction pulls the reader into the English countryside and she always, always delivers. In The Secret Keeper she’s upped the mystery quotient yet kept her appealing evocation of British life. At a 1960s summer picnic on her brother Gerry’s second birthday, sixteen-year-old Laurel escapes the chaos to dream in a tree house when a stranger arrives and speaks to her mother as she carries baby Gerry and the family’s special occasion cake knife tied with a bow. Laurel feels that something’s wrong especially when her mother wrests Gerry away as the man reaches for him. She was watching her mother’s face, an expression on it she’d never seen before. Fear, she realized, Ma was frightened. The effect on Laurel was instant. Certainties of a lifetime turned to smoke and blew away. Cold alarm moved in to take their place. He knew Ma’s name. The man was no stranger. . . The next thing happened quickly. It was the liquid silver flash that Laurel would remember. The way sunlight caught the metal blade, and the moment was very briefly beautiful. Then the knife came down, the special knife, plunging deep into the man’s chest. Laurel told the policeman the truth. She answered all his questions and told him that the man seemed scary and that he’d lurched toward the baby. But when he’d asked if there was anything else, anything she’d forgotten, she said, no. She knew she’d told the truth but things felt strange and uncertain. Later that day she realized that she hadn't told the policeman that the man had known her mother’s name. When her father came to comfort her, he told her that the man had been causing problems in the area and that it was over and all would be fine. Then he told her that they’d keep what happened to themselves so the younger children wouldn't be frightened. And they had. It became the great unspoken event in their family’s history. The sisters weren't told and Gerry was certainly too young to remember, though they’d been wrong about that as things turned out. Fifty years later, Laurel is a lauded actor, one that reminded this reader of Judi Dench, and she’s headed home for Dorothy’s ninetieth birthday, determined to find out what really happened at that long-ago picnic before it’s too late. She retraces Dorothy’s life from before World War II, through her days in London during the blitz and her farm life in the 1960s and beyond. Laurel’s investigation uncovers characters from her mother’s past whose stories begin to unravel the mystery at the root of the decisions marking Dorothy’s life. It is in these characters and their stories that The Secret Keeper shines. Vivian, Dorothy’s neighbor during the war, and Jimmy, Dorothy’s first love, are memorable characters living in a special time that Morton brings to life with panache. The Forgotten Garden is still my favorite of Morton’s four novels although it isn't as polished as The Secret Keeper. If you haven’t read any of her novels, I’d start with her first, The House at Riverton, so you can watch her writing evolve. The Secret Keeper will appeal to readers looking for a saga offering escape with intriguing characters, social climbing, jealousy, betrayal, and intricate plot twists. Above all though, this novel is about second chances and renewal and readers will love it for that. Kate Morton successfully weaves the lives of English common folk surviving in tiny warren apartments alongside the gentry in their grand estates. Summing it Up: Read this to escape to World War II London and the English countryside. As Dorothy’s early life in London reveals clues to the mysterious stranger’s death, allow yourself to fall under the spell of Kate Morton’s recreation of Britain during the blitz and in the years after when secrets haunt those that keep them. Simon & Schuster is putting on a big push for Morton who lives in Brisbane, Australia. She’s in the United States for appearances and interviews this week. With Halloween coming soon, it’s time to sit down with a cup of hot cider and enjoy this silly, wry take on Ludwig Bemelmans' beloved Madeline books that should make everyone including adults laugh out loud. Author Rick Walton’s use of the pen name Ludworst Bemonster* adds to the fun while Nathan Hale’s childlike illustrations evoke typical preschooler fantasies of what monsters should look like. Pulled out their teeth and wet their beds. The ugliest one was Frankenstein. He scared people out of their socks. He could even frighten rocks. This parody will make little boys whoop with laughter. It’s just “scary” enough for them to love but not so frightening that it’d cause nightmares. Girls who love Madeline will enjoy it, too, but I’d buy it for boys. If I were teaching preschool or kindergarten, I’d use this as a story starter and let the kids create their own monster books based on a slew of rhyming favorites I’d set out for them to peruse. I’d also encourage them to make their own crooked lines and walk like their favorite monsters might. Summing it Up: Enjoy the Halloween season with this silly, "scary" parody of the Madeline books. Give it to your favorite preschool or kindergarten-aged boy. When Will Schwalbe’s mother was dying of pancreatic cancer, he often sat with her during chemo and they talked about books. They’d always talked about books together but they soon realized that this was different; they’d created their own book club – one with just two members. Early on, I began wishing I’d known Mary Ann Schwalbe. What a woman she was: building a library in Afghanistan, serving as the Director of Admissions at Harvard, sharing unique experiences with her grandchildren. But, wait a minute; I know Mary Ann Schwalbe very well. Her son made me love this exceptional woman. I sat in on their discussions. I was there for the setbacks and the celebrations. At first I was concerned that the cancer diagnosis would mean that this book would be sad and I wasn’t sure I’d want read about this lovely woman’s demise. I’d been through something quite similar with my own mother and fear gripped me. Thankfully, I was wrong, utterly wrong; this book is a joyful tribute to life, living, the sheer pleasure of reading, and the shared intimacy of sharing what you cherish with someone you love. What reader wouldn’t delight in a book that celebrates reading and provides so many great titles. A book that takes the reader through chemotherapy treatments during which she and her son talk about the books they’re reading doesn’t sound like it’d be mesmerizing but it is. When Will Schwalbe asked his mother “What are you reading?” I was part of the conversation. And when books became a way to introduce topics that concerned them, I was cheering because some of those same books had helped me through similar difficulties. Yet, the Schwalbe conversations weren’t just about dying, they also shared happy stories. About Alan Bennett’s The Uncommon Reader, “How could anyone who loves books not love a book that is itself so in love with books?” Their enjoyment of this and books like The Elegance of the Hedgehog, People of the Book, A Prayer for Owen Meany, Olive KItteridge, Suite Française, and AThousand Splendid Suns made this voracious reader thrill to the fact that they also valued books that I adored. That made me eager to try the books they read that I hadn’t and thus a bonus of this marvel is that I now look forward to reading Too Much Happiness, Felicia’s Journey, The Bite of the Mango and several others. Will Schwalbe’s tribute to his mother and to the power of reading is a book for every book lover. It’s also the perfect gift for anyone in a book club. I initially thought the title mawkish but then Schwalbe reminded me, “We’re all in the end-of-our life book clubs, whether we acknowledge it or not; each book we read may well be the last selection; each conversation the final one.” Carpe diem, indeed. Summing it Up: Buy this book for everyone on your holiday list. Immerse yourself in the life of an exceptional woman. Discover a list of enticing new titles. The End of Your Life Book Club is an ebullient tribute to the power of the written word.